George became a type or symbol of successful combat against evil, so the legends grow up around his name and memory. The veneration of St George is both ancient and widespread. He is associated with the town of Lydda (present-day Lod) ten miles southeast of Tel-Aviv, Israel. A shrine there not far from Ben Gurion International Airport is claimed to be his tomb. He had a reputation as a dragon-slayer and after the Crusades his reputation spread to Europe. He is even considered as a patron of England. Patrick Duffy recalls some of the traditions about him. The veneration of St George is both ancient and widespread. In the East he was honoured as megalomartyros (“great martyr”) and in the West his feast day is mentioned in the Martyrology of Jerome (5th-6th century), the Gregorian Sacramentary (8th century) the Martyrologies of Bede in England and of Oengus in Ireland (9th century). Belgian Jesuit and Bollandist scholar Hippolyte Delehaye (1859–1941) maintained that the earliest text preserving fragments of the narrative of St George was a 5th century palimpsest. But, he pointed out, the compiler of this Acta “confused the martyr with his namesake, the celebrated George of Cappadocia, the Arian intruder into the see of Alexandria and enemy of St. Athanasius”. George is associated with the town of Lydda (present-day Lod) ten miles southeast of Tel-Aviv. His tomb can be found today in a chapel in that town, near Ben Gurion International Airport. The story is that he was a soldier in the Roman army. He is said to have at first obtained the favour of the emperor Diocletian and was promoted to the rank of tribune, but when the emperor began to persecute the Christians, George rebuked him, gave up his commission, was then tortured and finally beheaded. His cheerful defiance and fortitude has been an inspiration to Christians ever since. Devotion to him is one of the most ancient and widespread in the Church, both East and West. 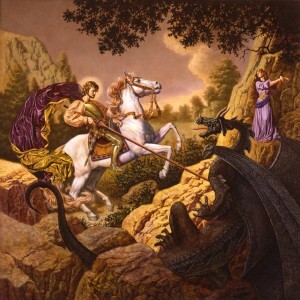 George soon became a type or symbol of successful combat against evil, so one can easily see how legends, such as the slaying of the dragon, would grow up around his name and memory. The story is that a dragon was terrorising the locality, poisoning with its breath all who approached it. Every day it was appeased with an offering of two sheep, but when these grew scarce, a human victim, chosen by lot was to be substituted. The lot had fallen on the king’s daughter who went to her fate dressed as a bride. But George attacked the dragon, pierced it with his lance and led it away completely tamed and tied with the princess’s girdle. George told the people not to be afraid: if they would believe in Jesus Christ and be baptised, he would rid them of the monster. The king and people agreed. George killed the dragon and 15,000 were baptised. The parallels with the classical myth of the rescue of Andromeda by Perseus, which is also associated with Lydda near Tel-Aviv are significant. The story became popular in the West through the Legenda Aurea (“Golden Legend”), a 13th century collection of Lives of greater saints written by Blessed Jacobus de Voragine (1230-99) and greatly contributed to the popularity of the saint’s cult. Palestinian Christians and even Muslims celebrate George as their patron saint, especially around Bethlehem, where he is believed to have lived in his childhood. A stone-engraved image of the saint (known as Mar Jirjes) in front of houses identifies them as Christian and the occupants seek his protection. In one hotel in Bethlehem, Saint George appears over the lift, as well as many other places throughout the building. In the town of Beit Jala, just west of Bethlehem there is a statue of Saint George carved of stone in the town’s main square showng the saint on his horse fighting the dragon. Not far away there is also a 16th century ancient monastery of St George. George’s popularity spread to Europe as a result of the Crusades. 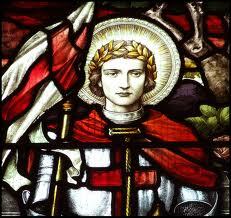 The Synod of Oxford 1222 declared St. George’s Day a feast day in the kingdom of England. His apparition to the Franks at the siege of Antioch 1098 is said to have greatly encouraged them, and he made a similar appearance the following year at Jerusalem. Military orders of St George were established in Aragon (1201), Genoa, Hungary, and by the Holy Roman Emperor, Frederick III. Portugal, Lebanon, Bulgaria, Belgium, Georgia and Russia are other countries which have devotion to St George and where he appears in images, icons and statuary. King Edward III of England (1327-77) founded his knighthood of chivalry, known as the Order of the Garter, under the banner of St. George. Many churches were dedicated to him in England and though his popularity may have lessened with the severe curtailment of saints days in the calendar during the Reformation, St George’s Day continued to be observed. His veneration as protector of England was approved by Pope Benedict XIV (Prospero Lambertini 1740-58).